The tilt table test is used to detect dizziness associated with either low blood pressure (orthostatic hypotension) or poorly regulated pulse (usually too high - -POT). The Valsalva test is done using similar equipment, and it may indicate impaired autonomic control. The tilt table test can be used to distinguish between pseudosyncope and syncope. Blood pressure is regulated using negative feedback. 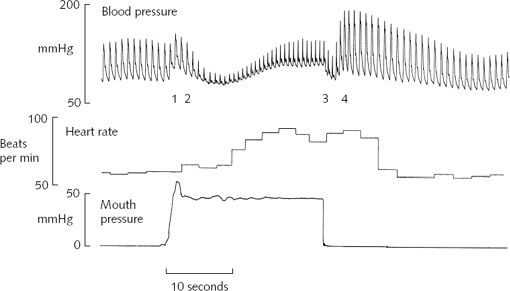 On the input side, pressure is sensed by the baroreceptors in the carotid sinus. There is also input from gravity receptors in the inner ear, and one's internal understanding about position. This signal goes to the brain, is processed in the brainstem, and then used to control heart rate (both parasympathetic and sympathetic), heart force (sympathetic), and blood vessel size (sympathetic). In general, regulation can be disrupted by lesions in the input, central processing, and output. There are also some extra inputs that change the level of blood pressure outside of the desired set point - -excitement of course increases blood pressure and pulse. The tilt table test changes the load on the heart by making it work harder, and tests the ability of the system to keep heart rate and blood pressure stable. Persons may exhibit several failure patterns resulting in fainting or light-headedness. 2. Too high pulse on standing (positional orthostatic tachycardia). 3. Too variable blood pressure -- Here individuals may have reduced responses to appropriate feedback of blood pressure, but too high responses to internal events that are not directly associated with blood pressure changes. Patients are strapped, in a supine position to a tilt table as shown above from our practice at Chicago Dizziness and Hearing. They are instrumented with a pulse oximeter and EKG leads to monitor blood pressure, heart rate and EKG. Blood pressure and pulse are recorded every minute for 5 minutes. Next, the patient is tilted 70 degrees, head-up and recording continues for another 25 minutes. Heart rate * blood pressure <= 9000 mm Hg/min. For example, a BP of 100 and a pulse of 90. Heart-rate or blood pressure decrease correlating with symptoms. The TTT is largely a measure of parasympathetic afferent (baroreceptor) and sympathetic efferent limb function. There is a larger drop of blood pressure compared to normal on standing if sympathetic tone fails. The "VASIS" classifications (Brignole, Menozzi et al. 2000) are used to interpret the tilt table test. Type 1 -- mixed. Both BP and HR are reduced. BP reduction precedes HR reduction. HR decreases by > 10%, but HR does not decrease to less than 40 beats/min. Type 3. Pure vasodepressor. BP is decreased but HR does not decrease more than 10%. Chronotropic incompetence -- no HR increase in spite of tilt. Positive carotid sinus massage - -test needs to be terminated due to one of the criteria above after carotid sinus massage. The Valsalva test is done while lying flat. It is largely a measure of parasympathetic (baroreceptor) input and vagal output to control the pulse. It consists of having the subject take a deep breath and strain for 20 seconds, to increase intrathoracic pressure. The pressure should be 40-50 mm. Note that the Valsalva test can also stimulate the inner ear -- see this page for detail about how this occurs and what it looks like. Valsalva test illustration (from http://www.answers.com/topic/blood-pressure). The normal physiological response consists of 4 phases, marked on the diagram above. Initial pressure rise: When the person strains, pressure rises inside the chest. This causes a modest rise in blood pressure. This is best done by having the patient exhale against a static resistance of 40-50mm Hg. Reduced venous return and compensation: Return of systemic blood to the heart is impeded by the pressure inside the chest. The output of the heart is reduced and blood pressure falls. This occurs over about 10 seconds. The fall in blood pressure reflexively causes blood vessels to constrict with some rise in pressure (10 to 20 seconds). This compensation can be quite marked with pressure returning to near or even above normal, but the cardiac output and blood flow to the body remains low. During this time the pulse rate increases. The compensation is mediated by the autonomic system's baroreceptors that detect this fall and initiate constriction of blood vessels and an increase in heart rate, so that mean blood pressure is restored. Pressure release: The pressure on the chest is released, causing a further initial slight fall in pressure. Venous blood can once more enter the chest and the heart, cardiac output begins to increase. Return of cardiac output: Finally there is a rapid increase in cardiac output and of blood pressure (24 seconds on). The pressure usually rises above normal (overshoot) before returning to a normal level. With return of blood pressure, the pulse rate returns to normal. The overshoot is related to autonomic nervous system controls. In persons with autonomic disorders, the compensation part of phase 2 may be absent. Blood pressure may falls continuously and a faint occur (such as in cough syncope). Similarly, the overshoot is absent. The Valsalva ratio is a measure of cardiac slowing during the Valsalva. Valsalva ratio = (longest R-R interval in phase 4) / (shortest R-R interval in phase 2). A Valsalva ratio > 1.20 is normal. A ratio <= 1.20 is abnormal. The VR is a measure of parasympathetic afferent (baroreceptor) and efferent (parasympathetic and sympathetic) autonomic nervous system function. Another measure that may be of interest is the 30:15 ratio. After 15 minutes of supine rest, subjects are stood up while the heart rate is continuously monitored. The 30:15 ratio is the ratio of the RR interval at beat 30 while standing to the RR interval at beat 15. On two repetitions, the highest ratio is accepted. The 30:15 ratio is also a measure of parasympathetic afferent (baroreceptor) and efferent cardiac autonomic nervous system function. Subjects are asked to breath at a rate of 6 breaths/min in the seated position. After a rest period of 5 minutes, the HR is monitored for at least 1 minute. The HR change with breathing is the mean difference between the maximal and minimum HR over at least 6 cycles. Individuals with POT (positional orthostatic tachycardia) have little respiratory variability, but large pulse changes on standing. There are several variants to the TTT, mainly aimed at increasing sensitivity. These are generally performed in hospital settings, under the supervision of cardiologists, because they involve administering substances that may precipitate angina. The cardiac system may be "stressed" by administering nitroglycerin, isoproterenol. There may also be an attempt to prevent syncope by administering a beta-blocker. For these variants of the TTT, IV access is required both to administer the drug as well as to provide a quick access to the circulation should resuscitation be needed. It is the author's opinion that these procedures are generally not warranted. They are can also be dangerous and precipitate a cardiac event. 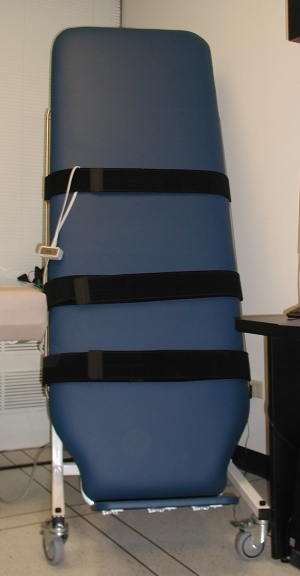 Tilt table testing is sometimes not fully covered by health insurance. It is common to have payment denied. Brignole, M., C. Menozzi, et al. (2000). "New classification of haemodynamics of vasovagal syncope: beyond the VASIS classification. 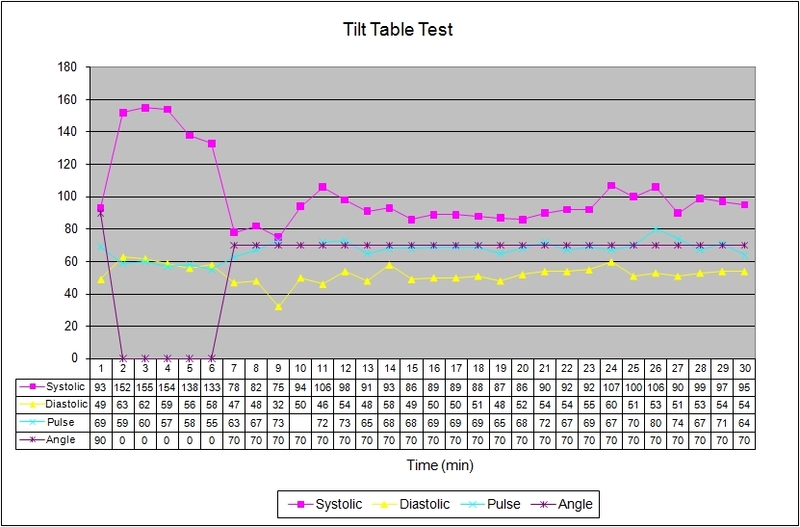 Analysis of the pre-syncopal phase of the tilt test without and with nitroglycerin challenge. Vasovagal Syncope International Study." Europace 2(1): 66-76. Kurbaan, A. S., A. C. Franzen, et al. (1999). "Usefulness of tilt test-induced patterns of heart rate and blood pressure using a two-stage protocol with glyceryl trinitrate provocation in patients with syncope of unknown origin." Am J Cardiol 84(6): 665-70. Schmidt, C., B. Herting, et al. (2009). "Valsalva manoeuvre in patients with different Parkinsonian disorders." J Neural Transm. Vlay, S. C., C. Brodsky, et al. (2000). "Safety and tolerability of an aggressive tilt table test protocol in the evaluation of patients with suspected neurocardiogenic syncope." Pacing Clin Electrophysiol 23(4 Pt 1): 441-5.